Why on earth would an 80 year old New Zealander pack his bags for good to spend the rest of his life in rural India, teaching farmers how to swirl cow dung in a vortex of water? Modern agriculture is nothing short of “war” and it has taken an enormous toll on the environment – toxic chemicals in the soil and food chains, soil erosion, loss of humus and soil fertility, water scarcity, desertification, algal blooms in rivers due to pesticide run-offs, loss of biodiversity in ecosystems and in varieties of food crops. Mega industrial farming has no spirit, no consideration for people, environment or social justice. The result is “untruthful” food – a product of layers of artificial chemical s, and many a time, genetic modification, and only serves a ruthless globalised machinery of “free” trade. Farmers find themselves in debt due to escalating input costs, and over 150,000 of them in India have killed themselves over the last decade, unable to cope. As opposed to this large scale chemical intensive onslaught, Proctor offers an alternative “grassroots” revolution, one that he believes to be “non-violent” agriculture. He shares his intimate knowledge and understanding of biodynamic farming, patiently and passionately with thousands of rural farmers. The term “Biodynamic farming” is often used interchangeably with organic farming. Though similar in principle in that it brings about balance, biodiversity and healing in the soils, the specific techniques used are quite different. 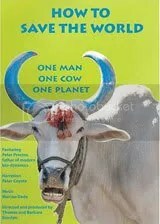 Critics often point to the methods as non-scientific and ritualistic, which is why Proctor finds easier acceptance of his techniques in rural India, as farmers have for generations venerated cows, and have worked in sync with circadian and cosmic rhythms. The movie is truly profound and inspiring, and provides an amazingly simple solution to the complex and deleterious world of industrial agriculture. Biodynamic farming enables true food security for thousands of farmers, and in the process restores the health of the soil, people and the local community, removed from the pressures of globalised market forces. The movie also shows a successful social enterprise, BioRe India which supports the biodynamic farming communities of the Indian state of Madhya Pradesh. It is possible to marry high ethical values and environmental responsibility with commercial considerations. “Fair” trade as opposed to “free” trade is the hope for the future.